Another otter has come into Wild ARC's care, this one in even worse shape than the last. We think she was attacked by a predator and barely escaped with her life, but now she needs your help too. Wild ARC now has three young otters that will need extensive over-winter care until they can be released next spring. This poor orphaned river otter was found bleeding and unable to escape from a sunken apartment patio. He was rescued by Alternative Wildlife Solutions, an AnimalKind accredited company, who brought the young otter to BC SPCA Wild ARC for care. He was extremely thin with multiple wounds, some so severe the muscle was exposed. It is believed he was orphaned for a while before he tumbled into the sunken patio where he sustained his injuries and couldn’t get out. 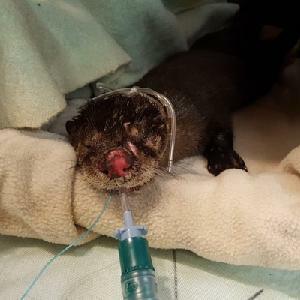 Despite his sad condition, treating this otter was no easy feat as he is very wild and quick to bite if given the chance. Now he will need months of rehabilitation at Wild ARC while staff monitor his wounds and allow time for him to return to a healthy weight. He will have to remain at Wild ARC until the spring of 2019 when outdoor conditions will be favourable for his release. Now he needs your help to ensure he grows up healthy and strong! Please help support the care of this young, orphaned river otter by donating today. Funds raised will go towards pain and antibiotic medications, food for his many months in care (including expensive items such as salmon, meat and shell fish) and expert staff who provide treatment for his wounds and enrichment for his enclosure which is essential to ensure he develops the skills he will need to survive in the wild. Thank you for caring about this otter! When an animal arrives needing urgent or extraordinary care, Medical Emergency brings animal-lovers, like you, together to help that animal. Help abused or abandoned animals get emergency surgery and urgent veterinary care. Don’t worry, we don’t wait until an animal has reached its fundraising goal to provide medical care. Timing for surgery, care and rehabilitation is based on what is medically best for the animal. We’re simply raising funds to pay the bills that come afterwards! © 2019 The British Columbia Society for the Prevention of Cruelty to Animals (BC SPCA).